Do you have a cunning cat, endowed with skill, ingenuity and a sense of inquisitiveness, or does your cute kitty merely crave creature comforts? With the help of 'Wedgie' the Mouse - a little 'furry' friend filled with our Rocket Fuel Catnip - use these treats to delve deep into your cat's personality! Find out if your cat prefers Catnip to catnap! 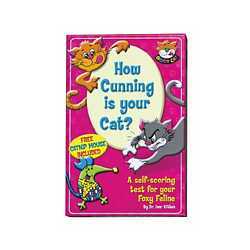 Discover if your feline friend is a predator or a purrer, or just plain playful!!! A collection of fun tests to determine the foxiness of your feline friend.